In view of the public interest of late in anything which has a warlike appearance or apparatus tending to render war less probable by making it more horrible and destructive, and in view also of numerous recent disasters at sea, the current descriptions in the daily papers of a new invention of Mr. Tesla and reported interviews with him have been received with widely differing comments. 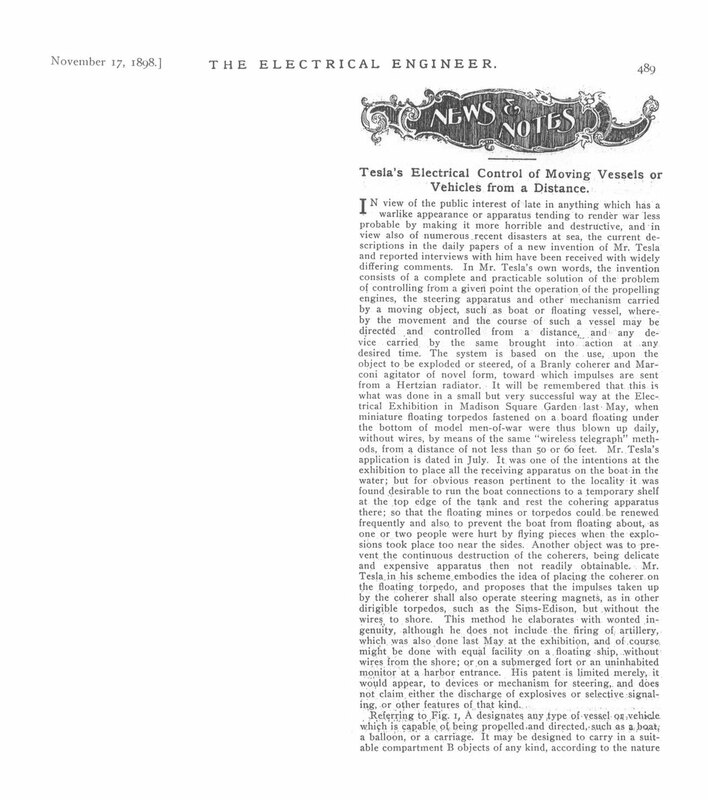 In Mr. Tesla’s own words, the invention consists of a complete and practicable solution of the problem of controlling from a given point the operation of the propelling engines, the steering apparatus and other mechanism carried by a moving object, such as boat or floating vessel, whereby the movement and the course of such a vessel may be directed and controlled from a distance, and any device carried by the same brought into action at any desired time. The system is based on the use, upon the object to be exploded or steered, of a Branly coherer and Marconi agitator of novel form, toward which impulses are sent from a Hertzian radiator. It will be remembered that this is what was done in a small but very successful way at the Electrical Exhibition in Madison Square Garden last May, when miniature floating torpedos fastened on a board floating under the bottom of model men-of-war were thus blown up daily, without wires, by means of the same “wireless telegraph” methods, from a distance of not less than 50 or 60 feet. Mr. Tesla’s application is dated in July. It was one of the intentions at the exhibition to place all the receiving apparatus on the boat in the water; but for obvious reason pertinent to the locality it was found desirable to run the boat connections to a temporary shelf at the top edge of the tank and rest the cohering apparatus there; so that the floating mines or torpedos could be renewed frequently and also to prevent the boat from floating about, as one or two people were hurt by flying pieces when the explosions took place too near the sides. Another object was to prevent the continuous destruction of the coherers, being delicate and expensive apparatus then not readily obtainable. 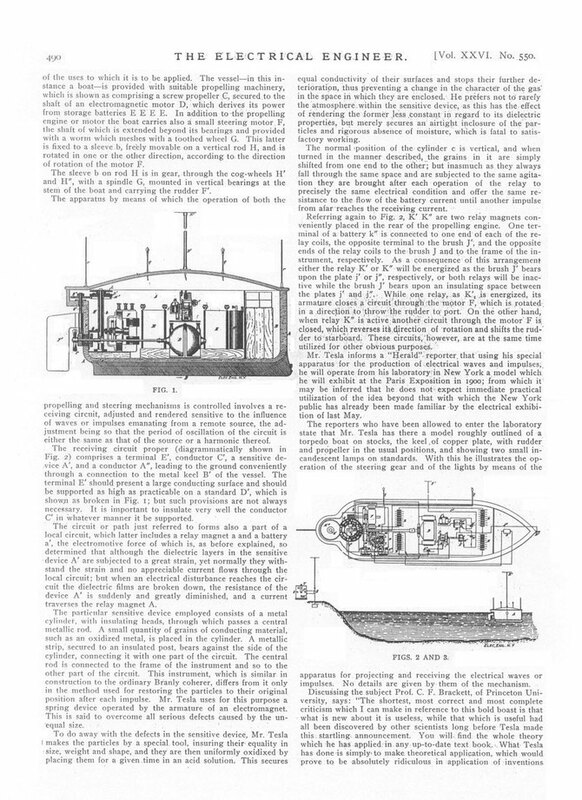 Mr. Tesla in his scheme embodies the idea of placing the coherer on the floating torpedo, and proposes that the impulses taken up by the coherer shall also operate steering magnets, as in other dirigible torpedos, such as the Sims-Edison, but without the wires to shore. This method he elaborates with wonted ingenuity, although he does not include the firing of artillery, which was also done last May at the exhibition, and of course might be done with equal facility on a floating ship, without wires from the shore; or on a submerged fort or an uninhabited monitor at a harbor entrance. His patent is limited merely, it would appear, to devices or mechanism for steering, and does not claim either the discharge of explosives or selective signaling, or other features of that kind. Referring to Fig. 1, A designates any type of vessel or vehicle which is capable of being propelled and directed, such as a boat, a balloon, or a carriage. It may be designed to carry in a suitable compartment B objects of any kind, according to the nature of the uses to which it is to be applied. The vessel — in this instance a boat — is provided with suitable propelling machinery, which is shown as comprising a screw propeller C, secured to the shaft of an electromagnetic motor D, which derives its power from storage batteries E E E E. In addition to the propelling engine or motor the boat carries also a small steering motor F, the shaft of which is extended beyond its bearings and provided with a worm which meshes with a toothed wheel G. This latter is fixed to a sleeve b, freely movable on a vertical rod H, and is rotated in one or the other direction, according to the direction of rotation of the motor F.
The sleeve b on rod H is in gear, through the cog-wheels H’ and H”, with a spindle G, mounted in vertical bearings at the stem of the boat and carrying the rudder F’. The apparatus by means of which the operation of both the propelling and steering mechanisms is controlled involves a receiving circuit, adjusted and rendered sensitive to the influence of waves or impulses emanating from a remote source, the adjustment being so that the period of oscillation of the circuit is either the same as that of the source or a harmonic thereof. The receiving circuit proper (diagrammatically shown in Fig. 2) comprises a terminal E’, conductor C’, a sensitive device A’, and a conductor A”, leading to the ground conveniently through a connection to the metal keel B’ of the vessel. The terminal E’ should present a large conducting surface and should be supported as high as practicable on a standard D’, which is shown as broken in Fig. 1; but such provisions are not always necessary. It is important to insulate very well the conductor C’ in whatever manner it be supported. The circuit or path just referred to forms also a part of a local circuit, which latter includes a relay magnet a and a battery a’, the electromotive force of which is, as before explained, so determined that although the dielectric layers in the sensitive device A’ are subjected to a great strain, yet normally they withstand the strain and no appreciable current flows through the local circuit; but when an electrical disturbance reaches the circuit the dielectric films are broken down, the resistance of the device A’ is suddenly and greatly diminished, and a current traverses the relay magnet A. The particular sensitive device employed consists of a metal cylinder, with insulating heads, through which passes a central metallic rod. A small quantity of grains of conducting material, such as an oxidized metal, is placed in the cylinder. A metallic strip, secured to an insulated post, bears against the side of the cylinder, connecting it with one part of the circuit. The central rod is connected to the frame of the instrument and so to the other part of the circuit. This instrument, which is similar in construction to the ordinary Branly coherer, differs from it only in the method used for restoring the particles to their original position after each impulse. Mr. Tesla uses for this purpose a spring device operated by the armature of an electromagnet. This is said to overcome all serious defects caused by the unequal size. To do away with the defects in the sensitive device. Mr. Tesla makes the particles by a special tool, insuring their equality in size, weight and shape, and they are then uniformly oxidixed by placing them for a given time in an acid solution. This secures equal conductivity of their surfaces and stops their further deterioration, thus preventing a change in the character of the gas in the space in which they are enclosed. 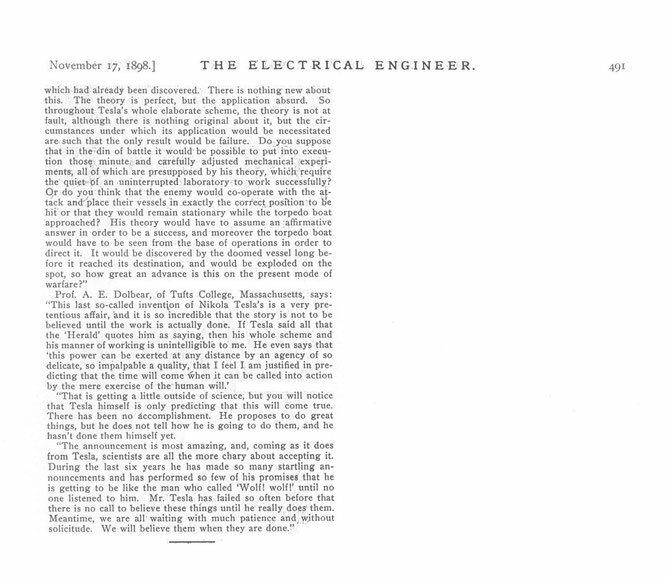 He prefers not to rarefy the atmosphere within the sensitive device, as this has the effect of rendering the former less constant in regard to its dielectric properties, but merely secures an airtight inclosure of the particles and rigorous absence of moisture, which is fatal to satisfactory working. The normal position of the cylinder c is vertical, and when turned in the manner described, the grains in it are simply shifted from one end to the other; but inasmuch as they always fall through the same space and are subjected to the same agitation they are brought after each operation of the relay to precisely the same electrical condition and offer the same resistance to the flow of the battery current until another impulse from afar reaches the receiving current. Referring again to Fig. 2, K’ K” are two relay magnets conveniently placed in the rear of the propelling engine. One terminal of a battery k” is connected to one end of each of the relay coils, the opposite terminal to the brush J’, and the opposite ends of the relay coils to the brush J and to the frame of the instrument, respectively. As a consequence of this arrangement either the relay K’ or K” will be energized as the brush J’ bears upon the plate j’ or j”, respectively, or both relays will be inactive while the brush J’ bears upon an insulating space between the plates j’ and j”. While one relay, as K’, is energized, its armature closes a circuit through the motor F, which is rotated in a direction to throw the rudder to port. On the other hand, when relay K” is active another circuit through the motor F is closed, which reverses its direction of rotation and shifts the rudder to starboard. These circuits, however, are at the same time utilized for other obvious purposes. Mr. Tesla informs a “Herald” reporter that using his special apparatus for the production of electrical waves and impulses, he will operate from his laboratory in New York a model which he will exhibit at the Paris Exposition in 1900; from which it may be inferred that he does not expect immediate practical utilization of the idea beyond that with which the New York public has already been made familiar by the electrical exhibition of last May. The reporters who have been allowed to enter the laboratory state that Mr. Tesla has there a model roughly outlined of a torpedo boat on stocks, the keel of copper plate, with rudder and propeller in the usual positions, and showing two small incandescent lamps on standards. 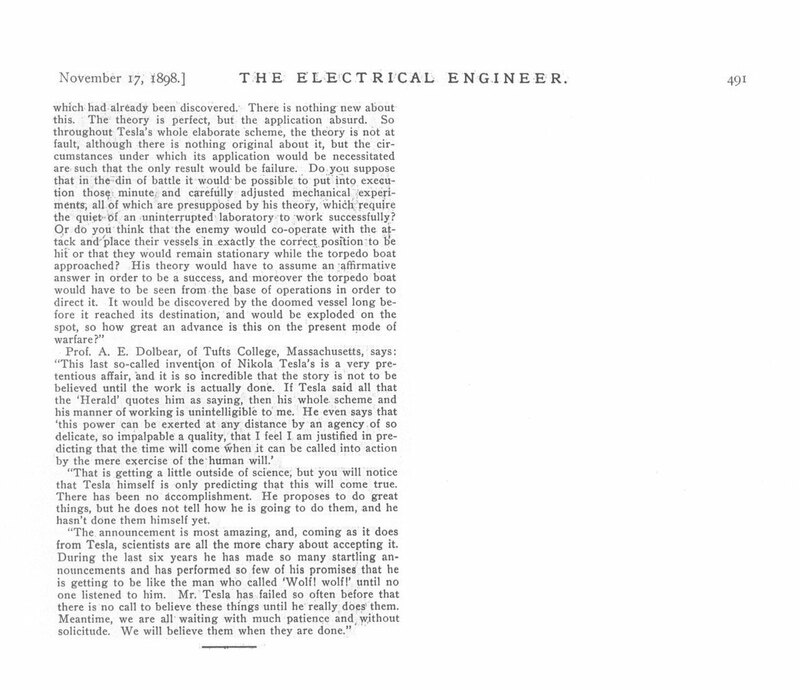 With this he illustrates the operation of the steering gear and of the lights by means of the apparatus for projecting and receiving the electrical waves or impulses. No details are given by them of the mechanism. “That is getting a little outside of science, but you will notice that Tesla himself is only predicting that this will come true. There has been no accomplishment. He proposes to do great things, but he does not tell how he is going to do them, and he hasn’t done them himself yet.